People make decisions of varying importance every day. Studies have shown that most people are much poorer at decision making than they think. An understanding of what decision making involves, together with a few effective techniques, helps make better decisions. A simple decision making process is shown in Fig 1. Decision making process is defined in many ways. Some of the definitions are given below. Decision making is the study of identifying and choosing alternatives based on the values and preferences of the decision maker. Decision making is regarded as the result of the mental processing for the selection of a course of action from several alternatives. 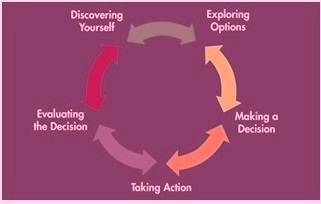 Each decision making process results into a final choice which can be an action or an opinion. Decision making is the process of sufficiently reducing uncertainty and doubt about alternatives to allow a reasonable choice to be made from among them. The various concepts in the decision making process are as follows. Information-This is knowledge about the decision, the effects of its alternatives, the probability of each alternative, and so forth. A major point to make here is that while substantial information is desirable, the statement that “the more information, the better” is not true. Too much information can actually reduce the quality of a decision. Alternatives – These are the possibilities one has to choose from. Alternatives can be identified (that is, searched for and located) or even developed (created where they did not previously exist). Merely searching for preexisting alternatives will result in less effective decision making. Criteria – These are the characteristics or requirements that each alternative must possess to a greater or lesser extent. Usually the alternatives are rated on how well they possess each criterion. Goals – What is it that a person wants to accomplish? Strangely enough, many people collect a bunch of alternatives and then ask, “Which should we choose?” without thinking first of what their goals are, what overall objective they want to achieve. Next time before asking, “What should we do? What should we choose?” people should ask first, “What are the goals?” A component of goal identification should be included in every instance of decision analysis. Value – Value refers to how desirable a particular outcome is, the value of the alternative, whether in money, satisfaction, or other benefit. Preferences – These reflect the philosophy and moral hierarchy of the decision maker. We could say that they are the decision maker’s “values,” but that might be confusing with the other use of the word, above. If we could use that word here, we would say that personal values dictate preferences. Decision quality – This is a rating of whether a decision is good or bad. A good decision is a logical one based on the available information and reflecting the preferences of the decision maker. Here it is important to note that the quality of a decision is not related to its outcome: a good decision can have either a good or a bad outcome. Similarly, a bad decision (one not based on adequate information or not reflecting the decision maker’s preferences) can still have a good outcome. Acceptance – Those who must implement the decision or who will be affected by it must accept it both intellectually and emotionally. Acceptance is a critical factor because it occasionally conflicts with one of the quality criteria. In such cases, the best thing to do may be to choose a lesser quality solution that has greater acceptance. Decisions are at the heart of success, and at times there are critical moments when they can be difficult, perplexing, and nerve racking. However, the boldest decisions are the safest. While decision making without planning is quite common, it is not desirable. The term used to describe it, is the crisis management. Decision making can be hard. All the decisions involve either some conflict or dissatisfaction. The difficult part in a decision making process is to pick a solution where the positive outcome must outweigh possible shortcomings. A critical factor of the decision making process is that it isa nonlinear, recursive process. That is, most decisions are made by moving back and forth between the choice of criteria and the identification of alternatives. The alternatives available influence the criteria we apply to them, and similarly the criteria we establish influence the alternatives we will consider. Decisions whether – This is the yes/no, either/or decision that must be made before we proceed with the selection of an alternative. Decisions which – These decisions involve a choice of one or more alternatives from among a set of possibilities, the choice being based on how well each alternative measures up to a set of predefined criteria. Contingent decisions – These are decisions that have been made but put on hold until some condition is met. Contingent alternatives – These are similar to contingent decisions. Contingent alternatives involve two or more choices of action, one of which will be taken when the appropriate trigger occurs. Often this trigger is an event or more information. To understand the significance of a decision in order to know how much time and resources to spend on it, decisions can also be classified in the following three types. Strategic decisions – These are the highest level of decisions. Here a decision concerns general direction, long term goals, philosophies and values. These decisions are the least structured and most imaginative. They are the most risky and their outcome is most uncertain, partly because they reach far into the future and partly because they are of great importance. Tactical decisions – These decisions support strategic decisions. They tend to be of medium range and medium significance with moderate consequences. Operational decision – These are every day decisions and support tactical decisions. They are often made with little thought and are structured. Their impact is immediate. They are short term, short range and usually low cost decisions. The consequence of a bad operational decision is minimal, though a series of bad or sloppy operational decisions can cause big harm. These decisions can be pre programmed, pre made, or set out clearly in policy manuals. The components of a decision making process are as follows. The decision environment – Every decision is made within a decision environment, which is defined as the collection of information, alternatives, values, and preferences available at the time of the decision. An ideal decision environment would include all possible information, all of it accurate, and every possible alternative. However, both information and alternatives are constrained because the time and effort to gain information or identify alternatives are limited. The effects of quantity – Often decision makers have a tendency to seek more information than required to make a good decision. When too much information is sought and obtained, one or more of several problems can arise. (i) A delay in the decision occurs because of the time required to obtain and process the extra information. This delay could impair the effectiveness of the decision or solution. (ii) Information overload will occur. In this state, so much information is available that decision-making ability actually declines because the information in its entirety can no longer be managed or assessed appropriately. Decision streams – A common misconception about decision making is that decisions are made in isolation from each other that is a person gather information, explore alternatives, and make a choice, without regard to anything that has gone before. The fact is, decisions are made in a context of other decisions. There are two major approaches to decision making in an organization, the authoritarian method in which an executive figure makes a decision for the group and the group method in which the group decides what to do. Authoritarian -The manager makes the decision based on the knowledge he can gather. He then explains the decision to the group and gains their acceptance of it. Group – In this approach to decision making process the group shares ideas and analyses, and agrees upon a decision to implement. Studies show that the group often has values, feelings, and reactions quite different from those the manager supposes they have. No one knows the group and its tastes and preferences as well as the group itself. Usually there are often many solutions to a given problem, and the decision maker’s task is to choose one of them. The task of choosing can be as simple or as complex as the importance of the decision warrants, and the number and quality of alternatives can also be adjusted according to importance, time and resources and so on. There are several strategies used for choosing. Some of them are the following. Optimizing – This is the strategy of choosing the best possible solution to the problem, discovering as many alternatives as possible and choosing the very best. How thoroughly optimizing can be done is dependent on the importance of the problem, time available for solving it, cost involved with alternative solutions, availability of resources, knowledge and personal psychology, values etc. Satisficing – In this strategy, the first satisfactory alternative is chosen rather than the best alternative. The word ‘satisficing’ had been coined by combining ‘satisfactory’ and ‘sufficient’. For many small decisions, the satisficing strategy is perfect. Maximax – This stands for “maximize the maximums” This strategy focuses on evaluating and then choosing the alternatives based on their maximum possible payoff. This is sometimes described as the strategy of the optimist, because favorable outcomes and high potentials are the areas of concern. It is a good strategy for use when risk taking is most acceptable. The decision making process isa nonlinear, recursive process. That is, most decisions are made by moving back and forth between the choice of criteria and the identification of alternatives. In a typical decision making situation, as one move from step to step here, he will probably find himself moving back and forth also. The decision making procedure consist of the following steps. The following are the steps in the procedure for decision making. Get the facts-It should be remembered that one cannot get all the facts. Get as many facts as possible about a decision within the limits of time imposed on the decision maker and his ability to process them. It is also to be remembered that virtually every decision must be made in partial ignorance. Lack of complete information must not be allowed to paralyze the decision. A decision based on partial knowledge is usually better than not making the decision when a decision is really needed. Any decision is better than no decision. Many decisions must ultimately rely on or be influenced by intuition. Also as part of fact collection exercise, those who will be affected by and who will have to implement the decision are to be consulted. Input from these people not only helps supply the decision maker with information and help in making the decision but it begins to produce the acceptance necessary in the implementers because they feel that they are part of the decision making process. Develop alternatives – A list of all the possible choices are to be made including the choice of doing nothing. Often a non decision is harmful. But sometimes the decision to do nothing is useful or at least better than the alternatives, so it should always be consciously included in the decision making process. Rate each alternative- This is the evaluation of the value of each alternative. The negatives of each alternative (cost, consequences, problems created, time needed, etc.) and the positives of each (money saved, time saved, added creativity or happiness to company or employees, etc.) are to be considered. However it may be that the alternative that one might like best or that would in the best of all possible worlds be an obvious choice will, however, not be functional in the real world because of too much cost, time, or lack of acceptance by others. Rate the risk of each alternative – In decision making there is always some degree of uncertainty in any choice. Risks can be rated as percentages, ratios, rankings, grades or in any other form that allows them to be compared. Make the decision – If one is making an individual decision he may apply his preferences (which may take into account the preferences of others). He must choose the path to follow, whether it includes one of the alternatives, more than one of them (a multiple decision) or the decision to choose none. There are eight decision making tools which are described below. Pareto analysis (PA) – It uses the Pareto principle by which one can achieve 80 per cent of the advantage of the entire job by doing only 20 per cent of the work. It helps in prioritizing our action points. Paired comparison analysis (PCA) – It is working out the relative importance of different options. PCA helps a person to work out the importance of a number of options relative to each other. It is particularly useful where a person does not have objective data to base on. PCA makes it easy to choose the most important problem to solve, or select the solution that will give the person the greatest advantage. It helps to set priorities where there are conflicting demands on the resources. Grid analysis (GA) – It is a useful tool for decision making and is regarding making a choice while considering several factors. GA is also known as Decision Matrix Analysis, Pugh Matrix Analysis or MAUT (Multi Attribute Utility Theory). It is particularly powerful where one has a number of alternatives as well as different factors either to choose from or to consider. This makes it a good tool for use in those important decisions where there isn’t a clear and obvious preferred option. Decision tree – It is choosing by valuing different options. It provides a highly effective structure within which one can lay out options and investigate the possible outcomes of choosing those options. It also helps a person to form a balanced picture of the risks and benefits associated with each possible course of action. Plus minus interesting (PMI) – It is regarding weighing the pros and cons of a decision. Some mind tools focus on selecting a course of action from a range of options. Before a person moves straight to action on the selected course of action, it is important to check that it is going to improve the situation. PMI is a useful tool for doing this. Force field analysis (FFA) – It is analyzing the pressures for and against change. FFA is a useful technique for looking at all the forces for and against a decision. In fact, it is a specialized method of weighing pros and cons. By carrying out the analysis a person can plan to strengthen the forces supporting a decision and reduce the impact of opposition to it. Six thinking hats – It is looking at a decision from different perspectives. Six Thinking Hats is a powerful tool that helps one look at important decisions from a number of different perspectives. It helps one make better decisions by pushing him to move outside his habitual ways of thinking. If a person looks at a problem with the Six Thinking Hats then he is able to solve it using all approaches. Cost benefit analysis (CBA) – It is for seeing whether a decision makes financial sense. The best available decision may not be worth implementing if one has to invest a lot of time and money in implementing it. CBA is a relatively simple and widely used technique for deciding whether to act on the decision. CBA amounts to adding up the value of the benefits of a course of action, and subtracting the costs associated with it. Costs are either one time, or may be ongoing. Benefits are normally received over time. In CBA it determines the time which is built into the analysis by calculating a payback period. The Delphi technique – It is achieving the results through consensus among experts. It’s a common observation that when one gets three experts together, he will often end up with four different opinions. This can lead to poor decision making. This is where a technique like the Delphi Method is needed to reach a properly thought through consensus among experts. Avoiding Groupthink – It is avoiding errors in group decision making. Groupthink is a phenomenon that occurs when the desire for group consensus overrides one’s common sense desire to present alternatives or express an unpopular opinion. The desire for group cohesion effectively drives out good decision making. The term Groupthink was coined by Irving Janis in 1972 when he was researching why a team reaches an excellent decision one time and a disastrous one the next. What he found was that a lack of conflict or opposing viewpoints led to poor decisions, because alternatives were not fully analyzed, and therefore groups did not gather enough information to make an informed decision. Impact analysis – It identifies the consequences of a decision. This technique is a useful brainstorming technique that helps one think through the full impacts of a proposed change. It is an essential part of the evaluation process for major decisions. It gives one the ability to spot problems before they arise, so that he can develop contingency plans to handle issues smoothly. Inductive reasoning – It is regarding drawing good generalized conclusions. It involves making useful generalizations about the environment as a whole, based on limited number of observations. It is an important technique that people use to build the models of reality they need to function effectively. While conclusions can be wrong if observations are faulty or are drawn from an unrepresentative sample, if properly used, inductive reasoning can be incredibly powerful. At the core of inductive reasoning, is the ability to look at outcomes, events, ideas and observations, and draw these together to reach a unified conclusion. Kepner-Tregoe matrix – It is an approach regarding making unbiased, risk assessed decisions. No matter what position one holds, from a director to a messenger, one makes decisions continuously. The success is linked to the quality of the decisions one makes. Hence decision making is universally important. Some decisions clearly have a greater impact than others, but the underlying skill is the same. The difference is in the scope and depth of the process one go through to reach the decision. One reason why decision making can be so problematic is that the most critical decisions tend to be made in the least amount of time. The time pressure results in taking shortcuts, jumping to conclusions, or relying heavily on instinct to guide one’s way. Decision making is a skill that can be learned and improved on. Somewhere between instinct and over analysis is a logical and practical approach to decision making that does not require endless investigation, but helps one weigh up the options and impacts. One such approach is called Kepner-Tregoe matrix. It provides an efficient, systematic framework for gathering, organizing and evaluating decision making information. The approach was developed by Charles H. Kepner and Benjamin B. Tregoe in the 1960s. The ladder of inference – This is avoiding jumping to conclusions. In today’s fast-moving world, one is always under pressure to act now, rather than spend time reasoning things through and thinking about the true facts. Not only can this lead him to a wrong conclusion, but it can also cause conflict with other people, who may have drawn quite different conclusions on the same matter. One needs to make sure that his actions and decisions are founded on reality. Similarly, when one accepts or challenges other people’s conclusions, he needs to be confident that their reasoning as well as his is firmly based on true facts. The Ladder of Inference helps one achieve this. Sometimes known as the Process of Abstraction, this technique helps one to understand the thinking steps that can lead him to jump to wrong conclusions, and thus helps him get back to hard reality and facts. Nominal group technique – It is prioritizing technique to achieve consensus. It is face-to-face group process technique for gaining consensus. A typical application is in organizational planning when a group needs to agree priorities in order to assign resources and funds. The benefit of the technique is that the group shares and discusses all issues before evaluation, with each group member participating equally in evaluation. The evaluation works with each participant nominating his or her priority issues, and then ranking them on a scale of, say, 1 to 10. Prioritization – It is regarding making best use of your time and resources. Prioritization is the essential skill one needs to make the very best use of his own efforts and those of his team. It is important when time is limited and demands are many. It helps one to allocate his time where it is most needed. With good prioritization one can bring order to chaos, massively reduce stress, and move towards a successful conclusion. Without it, one will flounder around, drowning in competing demands. At a simple level, one can prioritize based on time constraints, on the potential profitability or benefit of the task one is facing, or on the pressure one is under to complete a job. Reactive decision making – This is regarding making decisions under pressure. People tend to make decisions reactively when confronted with emergency situations or when a disaster unfolds. In these circumstances, the best decisions tend to be those that have been thought through and rehearsed ahead of time. An example is the emergency plan for evacuation in case of a fire. The normal decision making process generally involves defining of the problem, collecting of necessary information, developing options, devising a plan, executing and following-up. In reactive decision making there is not enough time to execute the full decision making process, meaning that it’s all too easy to make a bad decision when under pressure. This means that actions to be taken in an emergency should be carefully planned beforehand so that one can act appropriately when an event occurs. A refreshing article,sir. More often we tend to choose the CBA tool,but now I feel the other tools could also be very handy.